In the glass, pours hazy blond, with a large and firm white head. The aroma features primarily banana and clove notes. On the palate, it is very refreshing, with notes of cloves, fruit, and vanilla coming to the fore. Spicy and fruity finish. After reading about this beer, it’s pretty obvious I am from Germany! Well, not in this lifetime… but a previous. What’s even creepier than that, my mom’s side of the family has some Sedlmyr in the lineage. I hadn’t heard that name for a LONG time, but it immediately rang a bell. Looks like I am from Germany! Maybe that’s why I like beer so much? The beer pours out with a nice head. Looks like a wheat sitting in the glass. 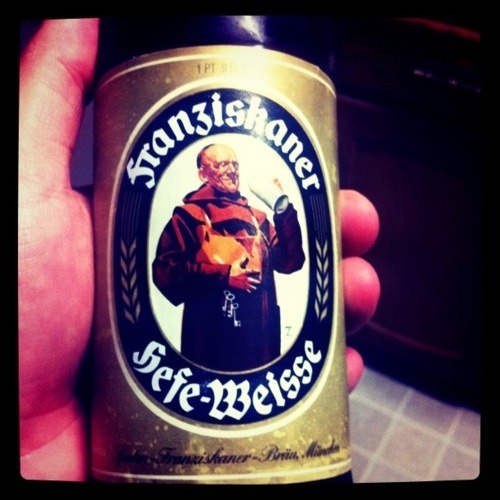 Makes sense, since this is a hefe-weisse. But the nose is MUCH more intense than a wheat. There is an immediate sour, fruit-based nose. Then it ends with a hint of spice and a subtle wetness that I often talk about. Let’s see what she tastes like. I bet this beer would taste better outside, during a hot summer day. Tonight’s beer is something German. I can’t even begin to pronounce the name of it or even the brewery where it is made. It looked pretty and for some reason was calling out to me, that’s why I picked it from the selection in our fridge. About all I can tell is that it’s some kind of weissbier. Let’s find out more. When I poured it out (after opening the gold foil that was over the cap), it foamed a LOT. It took me a few minutes to wait for all the head to die down a bit so I could pour it all into the glasses. The beer is a golden yellow color, typical of a wheat beer. It’s cloudy and slightly carbonated. I can still see the bubbles rising to the top of my glass. It has a spicy, citrusy, kind of lemon smell to it. Smells like a good summertime beer. Aside from the fact that I don’t even know what it tastes like yet, I could see myself sitting outside drinking this during the summer. Or – at a bar in Germany. Guess I better see what it tastes like first. Do you like Scottsdale blondes? I do! Not really, but I love the name. I like the style, too. Huss Brewing is new, and until this week I didn't know if they were even brewing their own beers.